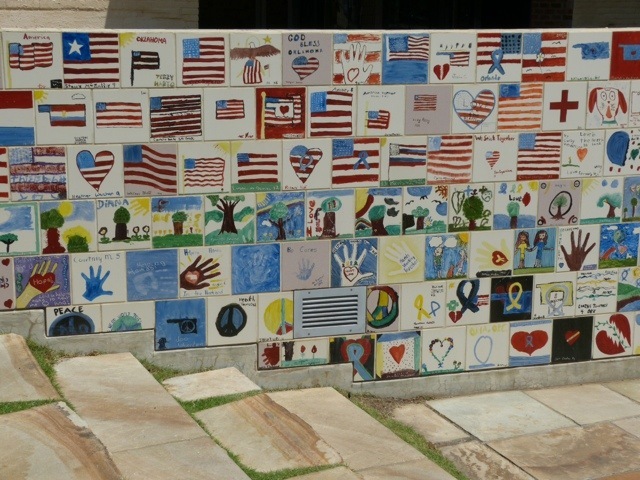 The Oklahoma City National Memorial was on my “must see” list. It made for a memorable and very moving two hour visit. 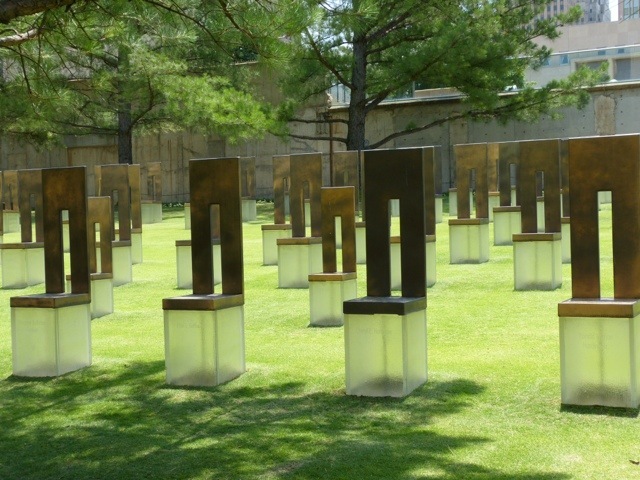 The chairs beside the reflecting pool are arranged in nine rows, to correspond to the nine floors of the Murrah building. The number of chairs in the row indicated the number of people who perished on that floor. What was particularly heart breaking was the second row with the nineteen small chairs representing the children that died in the bombing. I thought about all the times I dropped Greg off at daycare and started imagining the unbearable pain those parents must have felt standing outside, waiting and praying that their child would come out of the rubble alive. It was particularly poignant,given that I was visiting with Greg. I reflected on how much happiness he has brought into our lives and how lucky I am to have him as my son. How do parents find the strength to recover from loss of a child? 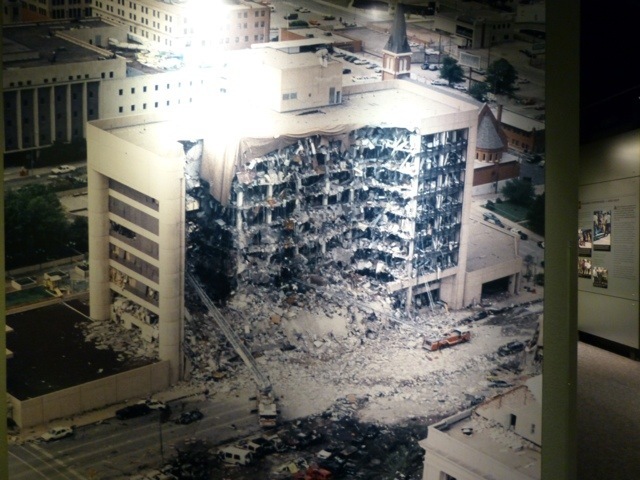 The bombing showed us both the worst of human nature and the best–as demonstrated by the first responders and the outpouring of love and support from around the world. 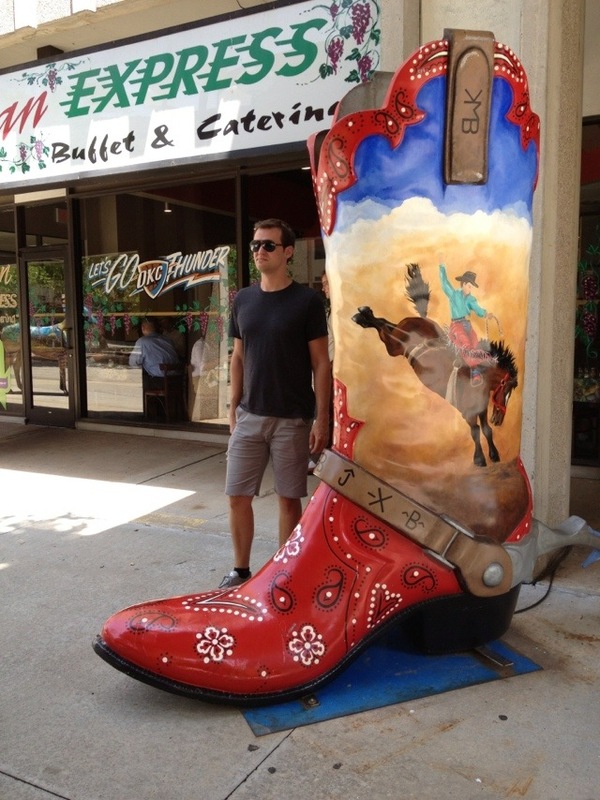 We needed something to lighten the mood, so next stop was the Cowboy and National Heritage Museum. The building and grounds are absolutely beautiful. 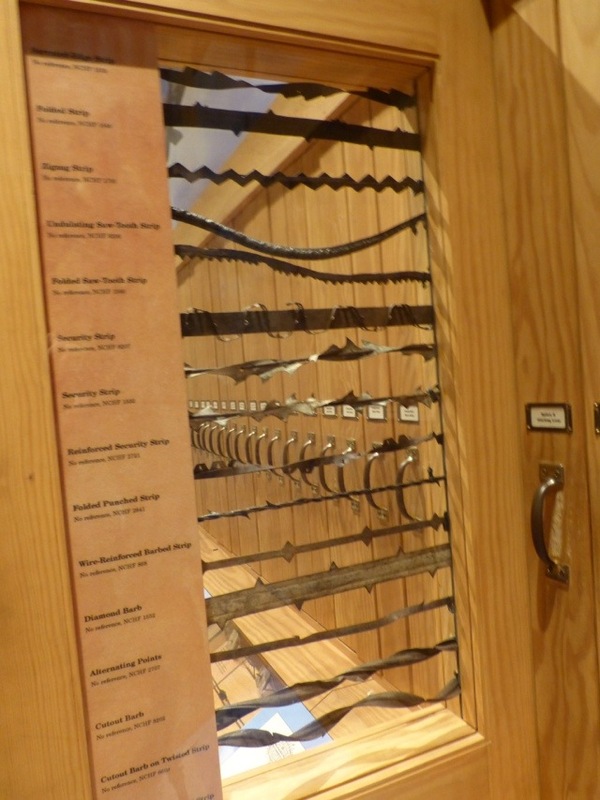 Where else can you find an entire WALL filled with cabinets of “devil’s rope”? Every one of the handles in the photo below is attached to a pull out display of barbed wire. But wait, Oklahoma–Texas can do you one better. 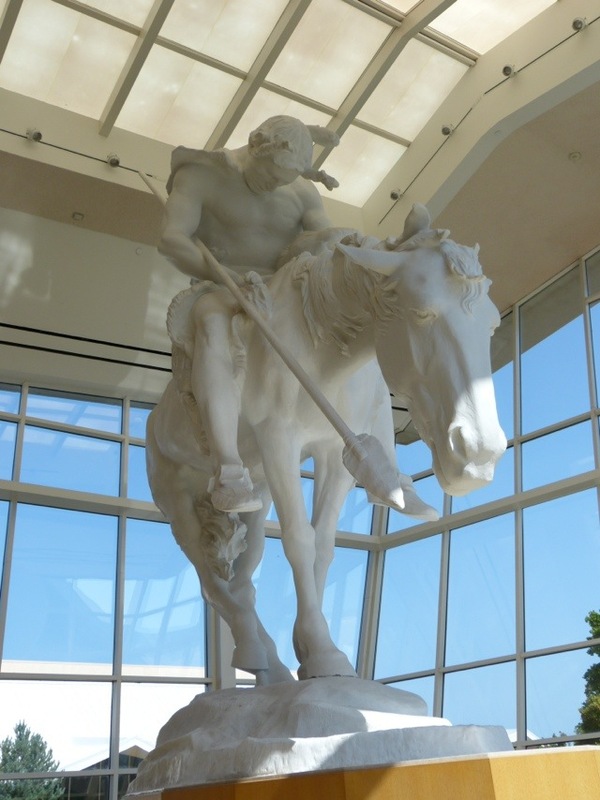 McLean, Texas has a its own Devil’s Rope MUSEUM! The replica of the western town was fun, especially the saloon. 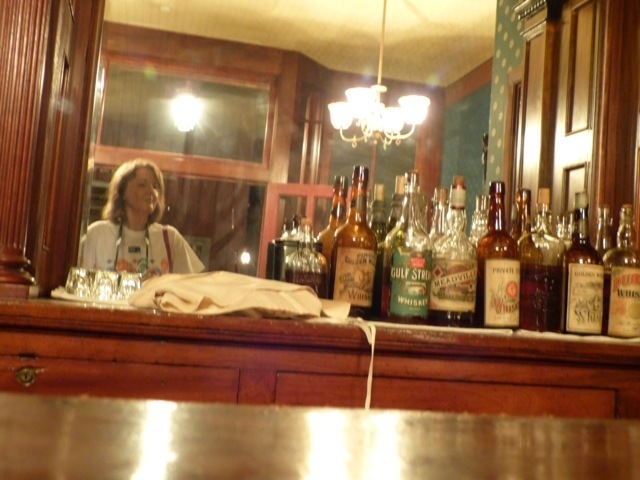 Here was my chance to belly up to the bar, just like a western workin’ gal. I didn’t have the proper attire, or hair ornaments,the light was low, and I couldn’t use a flash, so this was the best I could do to immortalize the moment. 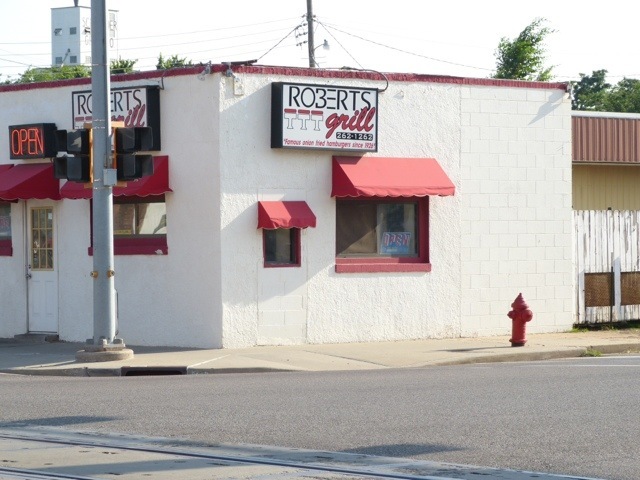 Oklahoma City was the starting point for our Route 66 adventure, so we headed west, planning to dine at one of El Reno’s famed establishments, Roberts. You can’t always judge a restaurant by its exterior, so we ventured inside. 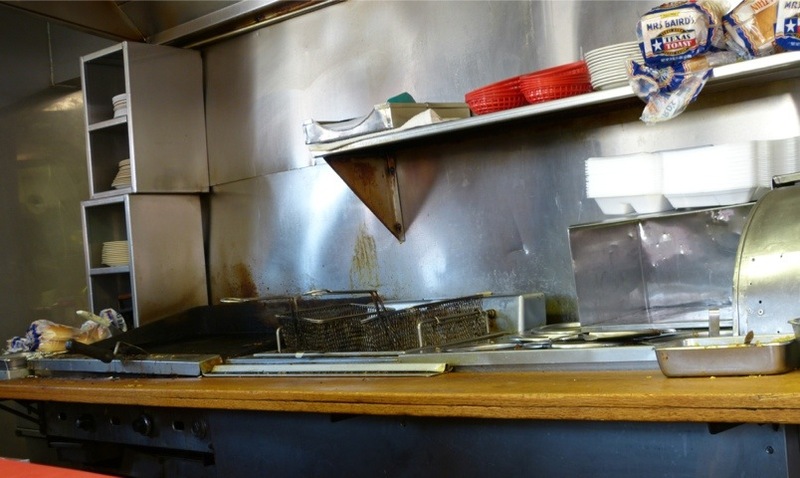 The interior consisted of a counter, with about 10 stools, some torn. Mine was wobbly enough to test my balance. Can you see why we decided to beat a hasty retreat? Back to Oklahoma City for dinner and lodging. 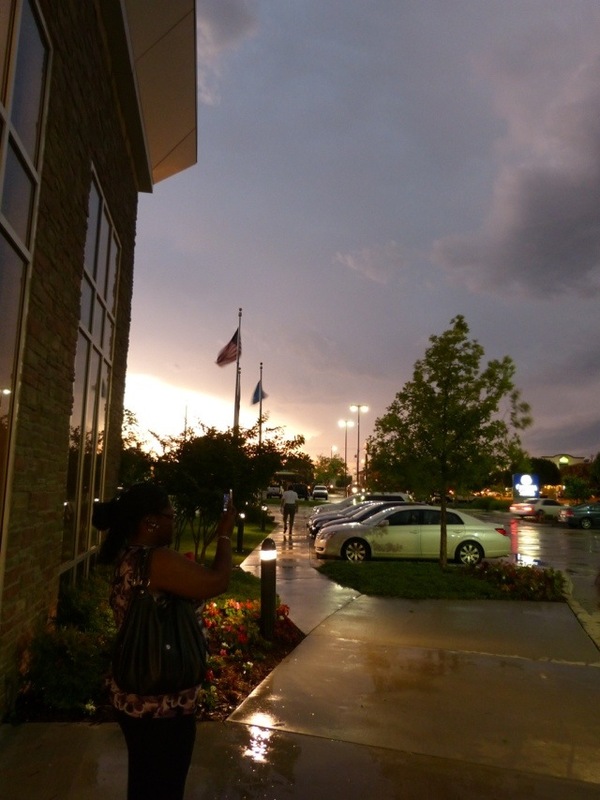 While in Oklahoma we experienced a wide range of human emotions: sadness, empathy, revulsion, excitement, then later anxiety, as we listened to the tornado alarms, and finally relief that Greg was smart enough to park his car under the hotel canopy. 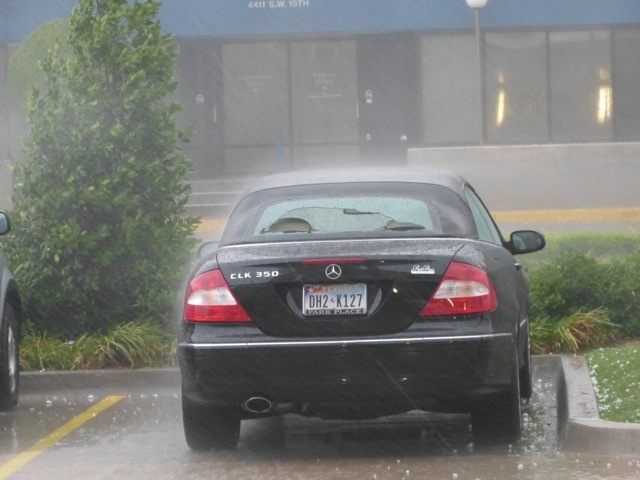 We watched hailstones ricochet off cars in the parking lot and felt grateful that we were not the owner of this Mercedes. Once we figured that we were not in the path of tornado, the evening took on a festive air, as we huddled with other travelers under the canopy to watch the storm pass by.